New 3-D printing Cubes sit in Rettner Hall, waiting to be used. Have you ever thought of putting your own spin on the tools and gadgets you use everyday, like a cellphone case with an edge for wrapping headphones, or a thin slider that helps you squeeze all the toothpaste out of the tube? 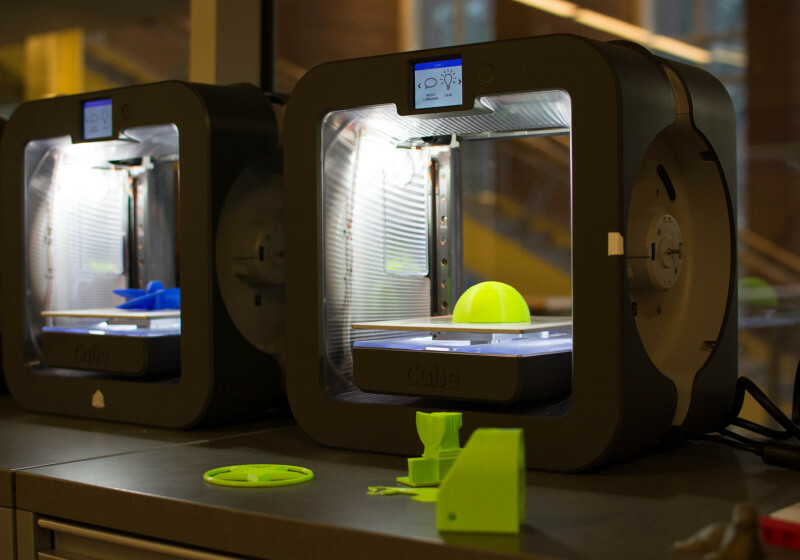 If so, you’re in luck—Rettner Hall has just purchased four brand-new 3-D printers that will be made available to the student body in about a week or two. The new 3-D printers are called Cubes. They weigh in at a sleek 17 pounds with a frame about the size of a small, block-like microwave. At its center is a moveable platform, which descends from the ceiling of the Cube as it prints. The platform allows for a six inches cubed of printing volume (picture a box around a large coffee mug), with a choice of 20 lab-tested colored plastics. But the number of colors that will be available for student use will be limited. The Cube also has a double extrusion mode so that projects can be printed using two colors at the same time, although this function will be temporary unavailable. You might wonder, “But I don’t have any experience with 3-D printers. Why would I use one of these?” That’s the great thing about this service; you do not have to know anything about 3-D printers to make something cool. A quick search online will bring you to dozens of free files for all types of funky projects. Going to the website for the Cube will bring you to cubify.com/designfeed, where you can find files for projects that others have made. If you do have experience with 3-D printing, then these files are easily editable, or you can make your own from scratch. Projects that have been printed at UR using the old 3-D printer include robotic hands, music boxes, and topographical maps of the U.S. Online, the possibilities are limitless. Designs range from drink coasters, to bottle openers, to shelves, and even clothing. If you can think of it, you can print it (given it’s not too large for the machine). Here is exactly what the printing process looks like. Grab your favorite design file or download one from the internet and put it on a flash drive. Then, bring it to the help desk on the second floor of Rettner. Congratulations, you’re done. You can come pick up your project three to five days after the drop-off date. 3-D printing will be a paid service, costing 10 cents per gram of plastic used. But don’t worry about figuring out all the weights and measurements of your project; the Rettner team has software that can do that for you, and they will let you know what the cost will be before printing. They also use Microsoft’s cloud-based netfabb tool that can fix design flaws, in case you are new to 3-D design or don’t trust the file you got online. If you are interested in learning how the facilities at Rettner Hall can help bring your projects to life, Associate Professor of History and director of the Digital Media Studies program Michael J. Jarvis will be giving a tech talk in Rettner titled, “The Latest Tech and Trends from Consumer Electronic Show CES 2016” on Tuesday, Feb. 2, at 1 p.m. The talk will center on what technologies Rettner Hall has to offer for both academic as well as personal projects.